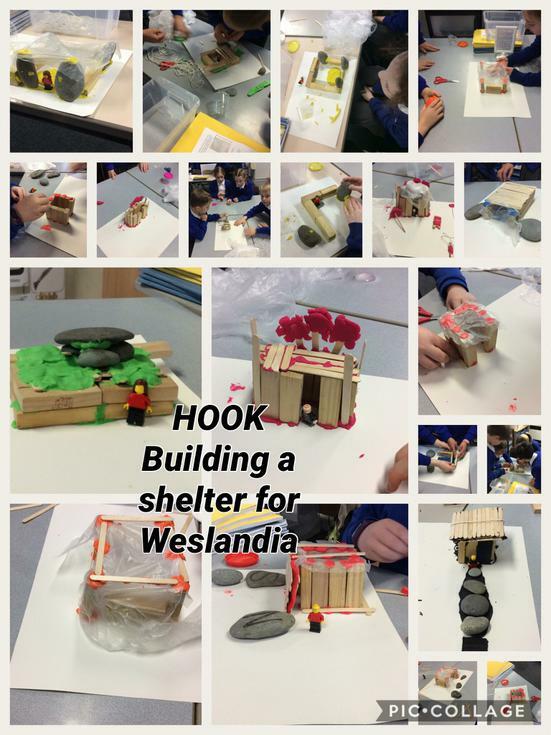 Wow the week has only just got started and we have already made some shelters for the main character of our focused text 'Weslandia'. We had to make a shelter for Wesley which is warm, waterproof and windproof. Have a look at our amazing shelters. ..
Our hard work didn't stop there as we had 'Drop Everything and Read Day' on Wednesday....watch this space for photos!! We were that engrossed in our reading we didn't want to get back to what we had been doing!! We have been multiplication experts in maths as we have been developing our skills to break into tricky problems using our plan, monitor, review dance. There is always a dance in Year 4!! Our work on Weslandia continued and the children tried so hard in their pre-writes that we can't wait to see what our final stories will be like. Mr Webster has kept been testing out the map skills of the children this week and they have been geography experts locating different cities in the UK and their distance from Manchester using a scale. Very impressive!!! Relax Kids has been taking place in Year 4 and we have been doing different brain breaks to help us re-focus. Why not ask your child to explain the different parts of our brain and show you some of the activities we have been doing to help ourselves stay relaxed? This week in celebration assembly Amy and Ava were the teachers and led the assembly. They gave out lots of dojos and did a superb job!! Next week watch out for Swap Shop happening next Friday. Remember to bring in any items you wish to swap to get your token!!! Look out for the letter all about the Sumdog trial. Your feedback would be greatly appreciated so please send the forms back in by next Friday (26.01.18) for some extra Dojos!! !